What are the units we need to worry about? Units, units, units. Every teacher in the world tells you that these things are important, and punishes you mercilessly until you learn them. They may seem annoying to learn, but… well, I don’t really have a finish to this sentence that will demonstrate that they’re fun to learn. I’ll be honest: Units are not fun to learn. However, they are unbelievably important when doing chemistry (or anything else, for that matter), so you’re going to learn them anyway. Wiktionary says that a unit is “a standard measure of a quantity.” This definition is not very handy, so let’s put that in terms normal people will understand. Units are widely accepted. If I say I’m 181 centimeters tall, everybody in the world will know what I’m talking about because everybody has heard of centimeters. If I were to use smoots instead, things would be much less clear. Units are standardized. If somebody tells me that they’re 182 centimeters tall, I know that they’re just a little taller than me, because I know we’re talking about the same “centimeters.” No matter where I go, one centimeter is the same as every other centimeter. (Within our frame of reference, anyhow, for the physics folks out there). Units tell you how big something is. If somebody says that the grass is “3” long, I will wonder whether I need to use a mower to cut it (if it’s three inches) or a machete (if it’s three feet). In a very real sense, units help us to understand the scale of the things we measure. Of course, it’s nice for everybody to agree on the same units before starting a project. After all, you wouldn’t want a simple mistake involving units to destroy a $327 million dollar spacecraft or anything. As you’ve probably heard, the units that you’ll need to be concerned with are the International System of units (abbreviated as SI because it comes from the French for “Le Système international d’unités“). The SI system is basically the most common version of the metric system, so you shouldn’t have much trouble understanding it, particularly if you live in a place that’s not America. Now, as an aside, let’s ask the big question many of you Americans are thinking right now: Why do we have to learn a different set of units? And why does everybody tell us that the units we’re used to (inches, feet, etc.) are bad? Here’s why people say that Imperial units are worse than SI units: It’s because these people don’t understand what they’re talking about. Yep, I said it. There’s absolutely no reason that you can’t use inches and feet, or degrees Fahrenheit, or pounds to do scientific measurements. However, and this is a big however, while Imperial units are every bit as marvelous as SI units for taking measurements, they’re also a lot less convenient. For one thing, it’s pretty simple to convert meters to microns in your head with a little practice, while it’s nearly impossible for anybody to convert 3.48 miles to feet without a calculator. That’s not to say that it can’t be done, just that it’s way more annoying to do it. That’s why the whole world (except for America and a few other places) uses the International System: It’s convenient. As a result, you need to learn SI units. And leave the crazy ranting about Imperial units to this guy and this guy. What are the units we’re interested in? Meters (m) are used to measure length. Though the meter was once equal to one ten millionth of the distance from the equator to the north pole, and later defined as the length of an arbitrary bar of platinum/iridium metal in Paris, a meter is now conveniently defined as “the length of the path travelled by light in vacuum during a time interval of 1 ⁄ 299,792,458 of a second“. Unless your teacher is a jerk, I don’t think you’ll need to memorize that. Kilograms (kg) are used to measure weight. One kilogram used to be defined as the weight of one liter of water at 4° Celsius, but it’s now equal to the weight of a big chunk of platinum/iridium metal in Paris. The folks who work on such things (the party monsters at CIPM) are working on making it something that’s based on a physical constant, but they have, at this writing, not yet done so. Seconds (s) are used to measure time. One second was historically 1/60 of an hour (which was 1/24 of a day), but is now defined as “the duration of 9,192,631,770 periods of the radiation corresponding to the transition between the two hyperfine levels of the ground state of the caesium 133 atom” at a temperature of 0 K. I assume that they would have made a prototype of a physical “second” out of platinum/iridium if it was possible to do so. Amperes (A) are used to measure electric current. Because I don’t really care about electricity, I’m not going to go look up interesting facts about it. If you’re interested, Google it or something. Kelvin (K) is the official unit of temperature. Originally, degrees Celsius were used in place of Kelvin, but the powers that be figured that it was too simple to use and decided to use Kelvin instead. At least, that’s what reliable sources believe. Fortunately for us, degrees Celsius (° C) are still in common use (they’re equal to Kelvin – 273), so we don’t have to get the tinfoil helmets out just yet. Moles (mol) are used to measure things in terms of numbers of particles. However, instead of counting vast quantities of things, we can just go ahead and say that one mole is equal to the number of particles in exactly 12 grams of carbon-12. In case you’re wondering, this number of particles is called “Avogadro’s number” and is equal to 6.02214129×1023 things. You’ll be seeing a lot of the mole in future chemistry lessons. Candelas (cd) measure the intensity of light. We don’t worry much about candelas in chemistry, so I’m going to skip this one. However, if you’re interested in learning more, these folks will tell you everything you need to know. Other units you may be familiar with from the metric system (centimeters, milligrams, and so forth) are based on these base units through the use of metric prefixes. We’ll get to that in a minute. Derived units are units that are based on some combination of the units above. They’re not the most fundamental units in the world, but they are related to them through some combination or another. Unfortunately for us, there are about a billion derived units, and I’m definitely not going to go through all of them. Some examples, however, include the units of density (g/mL), joules (newton meters), and the newton itself (one newton is equal to one kilogram meter per second squared). Now, before I get started, I know that some of you were taught by some teacher in the past to count the decimal places on your fingers when doing metric conversions. If that works for you, that’s super awesome, but it’s been my experience that it never works for anybody, ever. You’ll get it right sometimes, but be unhappy with the result other times. Learn what I’m writing below and you’ll be happy with everything that happens to you in life from now on. Unit-wise, anyhow. How many meters are in 41,000 millimeters? Now, you might be asking yourself that this works pretty well if you have to convert meters to millimeters, or micrograms to grams or something like that, but how about cases where you have to convert between two things with prefixes? For example, what happens to the unlucky soul who has to convert between centimeters and kilometers? Step 1: Convert 45 centimeters to meters. Step 2: Convert meters to kilometers. By breaking this somewhat complex problem into two somewhat less complex problems, you make your life a whole lot easier. 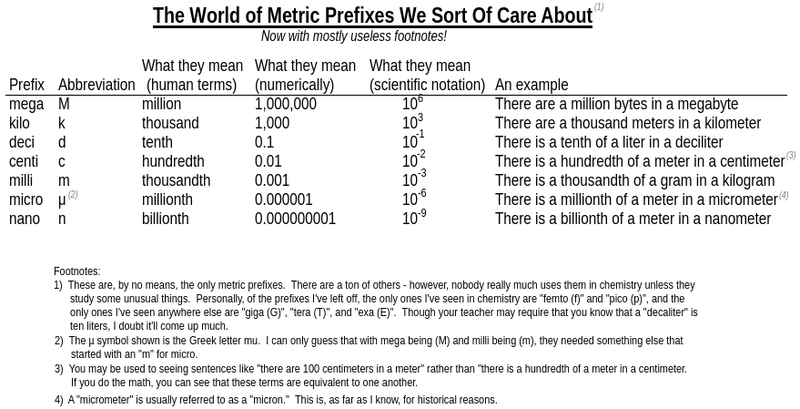 But (you might be asking right now), how about conversions between metric and nonmetric units? What happens if we need to convert between inches and centimeters? For no particular reason, convert 45 inches into centimeters. There are 2.54 centimeters in one inch. To solve, go through the same steps we saw above. However, when we get to step 6 (the one where we start putting in numbers), instead of worrying about prefixes and whatnot, just use the unit conversion factor that you were given in the problem. Which is to say, put “2.54” in front of “centimeters” and “1” in front of “inch.” Once you’ve plugged these numbers in, go directly to step 8 to solve. And, for the record, the answer is “110 centimeters.” If you said “114.3 centimeters”, give yourself a big frowny face for ignoring significant figures. Unit Conversions Worksheet: Bring the fun to your own home with this instructive and awesome practice sheet. 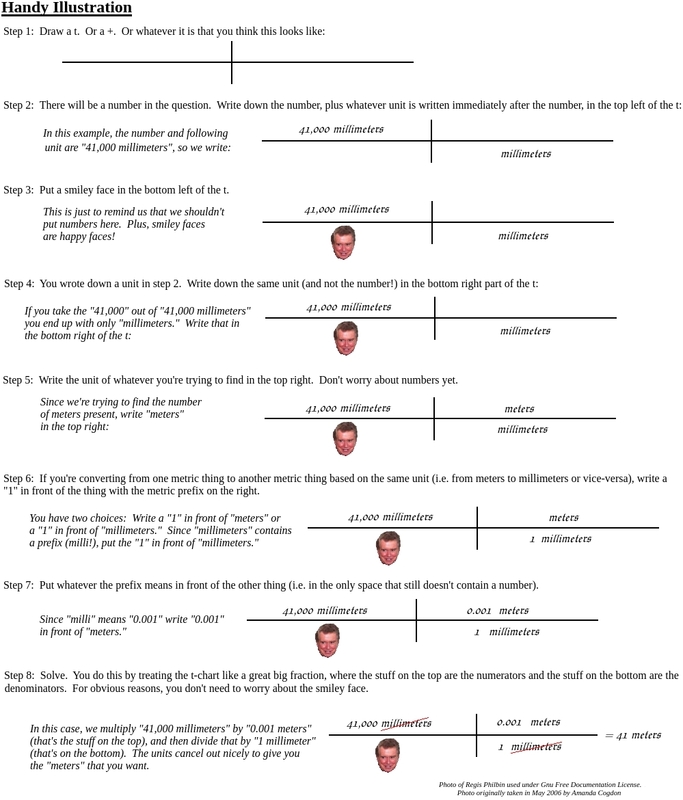 Some questions I’ve answered about units in the past: Maybe you have the same questions, in which case you’ll have them answered. Maybe not, in which case… well, you get the idea. Good video: Unit Conversions and Significant Figures: Crash Course #2 : A great video from the Crash Course series of videos by John and Hank Green. Yes, John and Hank do look alike. And yes, Hank’s voice is a little nasal. This webpage and the related worksheets are licensed under the Creative Commons Attribution-NonCommerical-ShareAlike 4.0 International license (CC BY-NC 4.0). For more information about this license and how it affects how you can use the contents of this site, click here. For those of you who need to cite this using incorrect methods such as MLA, APA, and Turabian, it was written by Ian Guch on September 11, 2014. If you’d like to cite this page correctly using ACS style, click here.